Available — Environs Development, Inc.
Property Features: 7 Bed | 7.1 Bath | 9,300 sq. ft. Introducing 1823 Howe. Offering every imaginable space for gracious living, construction is now complete on this breathtaking residence from Environs. Situated on a 36-foot lot & a half on prestigious Howe Street and comprising 9,300 square feet, the home features a five stop Elevator, attached 3 car heated Garage, His and Hers Master Bathrooms and ample gathering spaces for elegant entertaining. Thoughtfully designed to seamlessly blend light-filled interiors with open-air living, the highlight of the home is a 3rd Floor Lounge that flows to a covered Veranda with outdoor fireplace and steps up to a 4th Floor Penthouse Skydeck with panoramic skyline views. 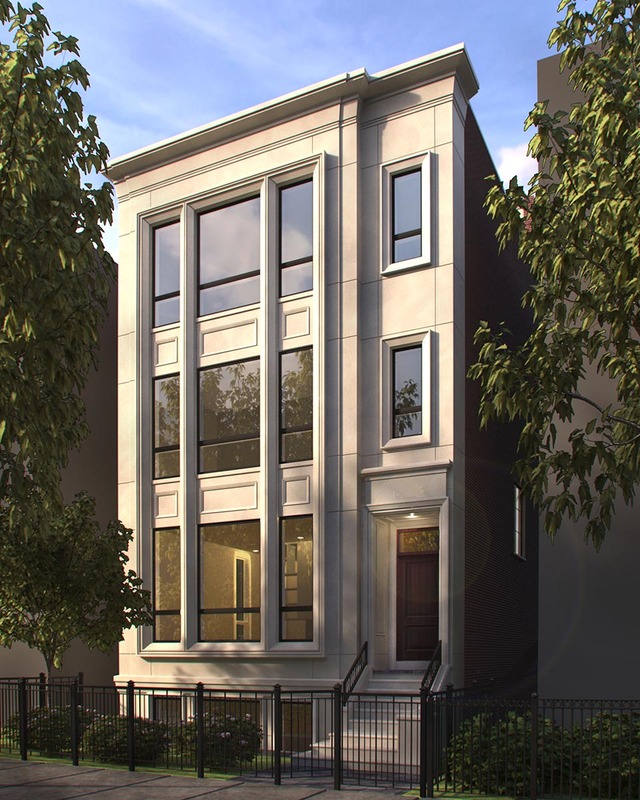 This incredible home is appointed with state-of-the-art finishes, gorgeous fixtures and contemporary amenities, all selected with the most discerning eye by Chicago's most highly regarded Design/Build firm. Move right in to this exceptional residence. Price: $3,250,000 Delivery - Just completed and move-in ready! Property Features: 7 Bed | 5.1 Bath | 7,350 sq. ft.
Coming soon from Environs Development in the Blaine SD on a jumbo wide and extra deep 29 x 165 lot! This massive new construction home will offer a 7,350 SF layout with four bedrooms on the second level, spacious mudroom, optional 4 stop elevator, massive rear yard and a 3 car garage. R-4 zoning allows an expansive Penthouse level featuring a giant family room plus two additional bedrooms and a roof deck. Lower level with a large recreation room, exercise room and guest suite. Don't miss this opportunity to customize the façade, floorplan, finishes and style with Chicago's most highly regarded and skilled Design/Build firm. Property Features: 7 Bed | 8 Bath | 6,972 sq. ft. Incredible new construction design/build opportunity coming soon from Environs Development on premier Cleveland Avenue. This remarkable home benefits from side-yard zoning relief to be extra wide and features 6,972 square feet with a breezeway attachment to a 2 car heated garage with Mudroom and a 4 stop Elevator. Thoughtfully designed to seamlessly blend indoor and outdoor environments, outdoor space will include a stone terrace flowing directly from the Great Room, a Garage roof deck and a 3rd floor covered Veranda with outdoor fireplace. Don't miss this exceptional opportunity to allow Environs' team of in-house architects and interior designers help channel your unique dream home vision into reality. Property Features: 6 Bed | 6.1 Bath | 8,000 sq. ft.
Amazing new construction design/build opportunity coming soon from Environs Development on highly prestigious Howe Street. Don't miss this rarely available chance to customize lot width and home size on this substantial 3 lot parcel. This 30' wide lot option will offer 8,000 square feet with an attached, 3 car heated garage and 5 stop elevator providing access to a massive penthouse skydeck with panoramic skyline views. Other lot width and square footage options available. Exceptional opportunity to customize the facade, style, floor-plan and finishes with Chicago's most highly regarded Design/Build firm. Incredible new construction design/build opportunity coming soon on premier Cleveland Avenue! This remarkable home will feature 7,400 square feet with an attached 2 car heated garage with Mudroom, and a 5-stop Elevator providing access to a huge 4th floor Penthouse with Skydeck. Thoughtfully designed to seamlessly blend indoor and outdoor environments, the home will offer 1,500+ square feet of outdoor space, including a stone terrace that flows directly from the Great Room, a Garage roof deck, a 3rd floor covered veranda with outdoor fireplace, plus the 4th floor Skydeck with amazing panoramic city views. Don't miss this exceptional chance to let out team of architects and designers help you channel your unique dream home vision into reality. Don't miss this amazing new construction design/build opportunity available from Environs Development on a rarely available 99 foot wide quadruple lot on highly prestigious Howe Street. 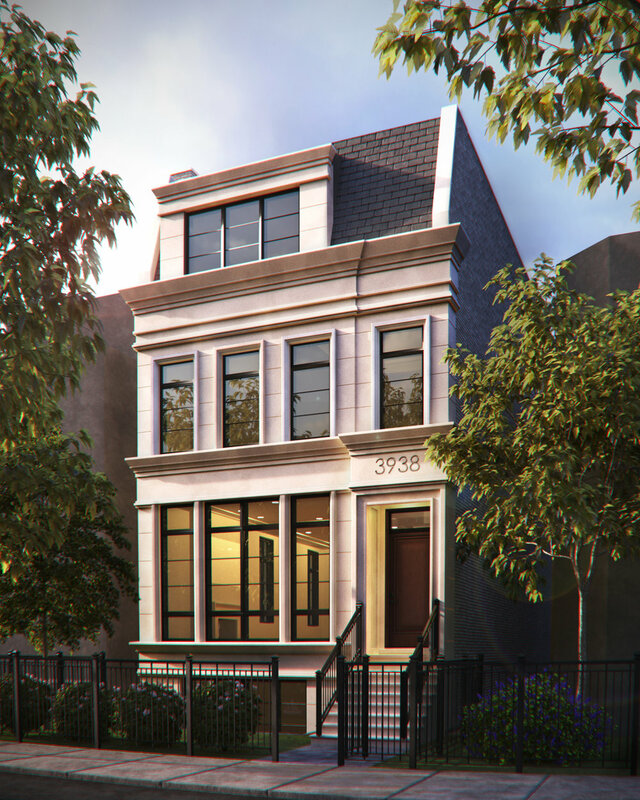 Join forces with Chicago's preeminent Design/Build firm to create your dream home on this premier triple Lincoln Park lot. Let Environs' professional team of architects and interior designers guide you through the home building process, customizing the design, amenities and finish selections to your specific needs. This remarkable home offers too many sophisticated standard features to list but includes an elevator, attached garage, expansive outdoor space and options for indoor pool, golf simulator, indoor basketball court, and beyond. A home of up to 21,000 SF is allowable on this site. With only 10 distinctive residences, Schubert Pointe is a boutique elevator building offering meticulously designed luxury homes highlighted by expansive outdoor living spaces. Prices ranging from $1,000,000 to $1,650,000. Click below for more details. Sorry! This home’s been sold! Property Features: 6 Bed | 5.1 Bath | 6,757 sq. ft. Sorry! This home has been sold! Property Features: 6 Bed | 5.1 Bath | 5,120 sq. ft.
Property Features: 6 Bed | 5.1 Bath | 5,230 sq. ft.
Property Features: 7 Bed | 5.1 Bath | 7,300 sq. ft.
Property Features: 5 Bed | 5.2 Bath | 6,707 sq. ft.
Property Features: 7 Bed | 7.1 Bath | 8,800 sq. ft. Sorry! This home has been sold. Property Features: 7 Bed | 6.1 Bath | 6,880 sq. ft.
Property Features: 6 Bed | 6.1 Bath | 8,350 sq. ft.